Distance is the main discipline in the dock diving sport. The game is how far can your dog jump. This is measured where the base of the tail enters the water. We use certified judges who have been trained to measure the distance. There can be one or two handlers on the dock. If using two, one usually holds the dog in place revving them up, then releasing them while the other handler throws the toy. If only using one handler, the dog is usually in a sit stay position until the handler releases the dog and throws the toy. The dock is 8′ x 40′ and sits 2′ above the water. The entire dock can be used or less if you choose. You get 2 jumps per “splash”. The best distance from your 2 jumps is your final score for that splash. There are usually 6+ splashes in a weekend. The top 3 dogs in each division receive a placement ribbon. See event details for more information on placements. Please go to the organization’s website for rules and membership information. 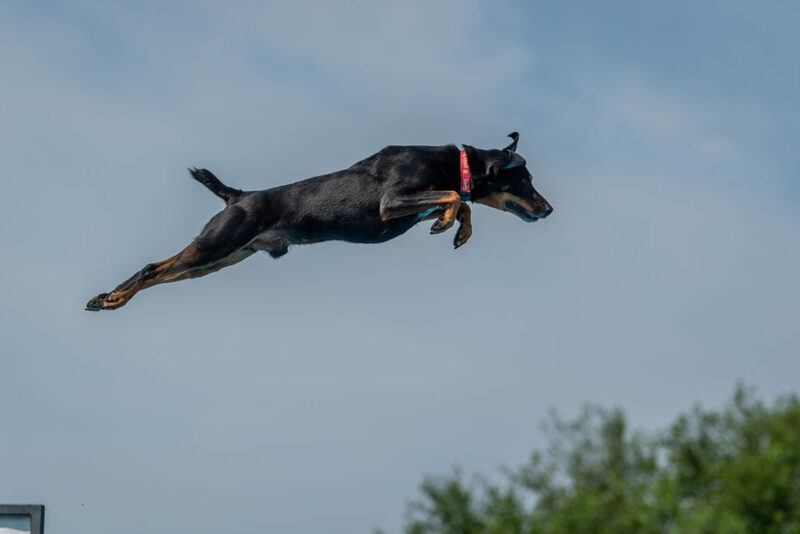 UKC – hosted by Northern Illinois K9 Association or NADD – North America Diving Dogs. You do need to be a member of each organization in order to compete in their events.